As the months and years continue on Americans are slowly becoming aware of our economic and environmental issues. Unfortunately the delay in informing the public has to do partly with politics and the [want] to know. What brings me to this current topic of water shortage is a trip to the grocery store. I was doing my weekly shopping and pondered at the different water bottles. One brand that stood out the most was Smart Water, and the slogan “portion of proceeds go to having cleaner water”. After staring at the water that i [purchased], when i got home i remembered and article about a Bolivia and the privatization of water. I then went on the internet to educate myself in the world water shortages or clean water, and stumbled across a documentary called BLUE GOLD and WATER WARS. Like most documentaries you have to remain open on the topics due to the film makers point of view, but i felt they did a good job presenting both sides of the argument. After watching the documentary I researched U.S shortages and locations. Water shortage is not a new topic [in fact] this has been around for years, but its wasn’t until now that I educated my self in the growing problem. An article written by Charles B. Stockdale, Michael B. Sauter, Douglas A. McIntyre, hit the top Ten cities in America having this problem. Although, to those living in the cities it doesn’t come as a surprise in the arid parts of America that have had water shortages for decades or even centuries. This problem is worse than most realize even in the top ten cities. 24/7 Wall St. also did its own analysis of water supply and consumption in America’s largest cities, and focused on the thirty largest metropolitan areas. One goal was to identify potential conflicts in regions that might have disputed rights over large supplies of water and the battles that could arise from these disputes. 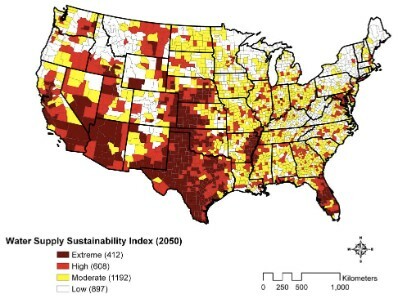 And, 24/7 Wall St. examined geographic areas that have already been plagued by drought and water shortages off and on. A projection was done for the next ten years and the top ten cities will deplete there water sheds, because of expansion, non water conservation in homes, apartments, watering lawns that need excessive amounts of water to keep green, and not having a plan to return water back to the ground to replenish the ground water. Since I currently live in one of these affected areas, am i surprised……… [no], but i want to know more about my cities water plans for minimizing the shortage. Last thing that any of these cities or any other city needs is the water shortage: water is LIFE. We do not need a repeat of LA in the 1980’s. It was so bad that LA had to stop using 40% of its water because of industrial runoff contamination. And like Las Vegas, LA relies on water coming form the Colorado River. Most western southern cities in the U.S rely on the Colorado River Aqueduct. As more expansion and demand on the aqueduct water supply occur, the more depleted our water source will be. We will not be able to replenish at the rate of consumption. I hate to say it; but if we do not correct our habits of living beyond the needs. In the very near future we will be relying on other countries to supply water to us. Water is life. We all need it to live. With our cities low on water water, this makes us dependent on those who have the power to distribute “life” to us. I encourage you to make yourself aware of your cities water plans for keeping water sustainable. Discuss with your city council to have water conserving toilets, faucets, and shower heads placed in new and existing homes/apts, if this is not already being done.